“Clubfoot” George Lane – Outlaw Shoemaker? “Clubfoot” George Lane, a shoemaker by trade, was accused of being a member of Henry Plummer’s gang of Innocents and hanged by Montana Vigilantes in January 1864. A small man who was crippled due to a birth defect, Lane was originally from Massachusetts and made his way to the west during the California Gold Rush. He first worked on a farm in Yuba County, before making his way to Calaveras County, where he worked as a store clerk. He turned himself in to the Fort Lapwai commander, who assigned them to help with building construction. The following year, he and another man were accused of a similar crime, that of driving a stolen horse herd toward the Snake River. The alleged horse thieves escaped and by the fall of 1863, Lane had made his way to Virginia City, Montana. He soon went to work for Dance and Stuwart’s Store mending harnesses and making and repairing boots. Quickly earning the respect of his employers, he came under suspicion when he rode to Bannack, Montana to inform Henry Plummer of the George Ives trial taking place in Nevada City in December,1863. 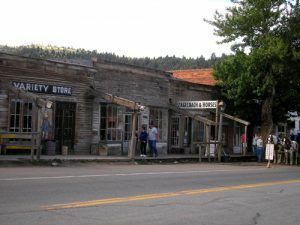 Though Plummer was absent at the time, Lane told Deputies Ray and Stinson of the growing vigilance movement in Virginia City. Virginia City, Montana by Kathy Weiser-Alexander. The following month when the Vigilance Committee met, Lane’s name immediately came up as a “spy” for the outlaw gang called the Innocents. On January 14, 1864, he was arrested at Dance and Stuart’s store. When he asked why he was being arrested, the men informed him “For being a road agent, thief, and an accessory to numerous robberies and murders on the highway.” Lane responded by saying, “If you hang me, you will hang an innocent man.” Though the men that he worked for had come to respect him, they presumed that the vigilantes had evidence against Lane and did not intervene. Though there were residents that felt like Lane was innocent of any crimes, the Committee tried Lane and found him guilty. He, along with Frank Parish, Boone Helm, Haze Lyons, Jack Gallager were sentenced to be hanged. 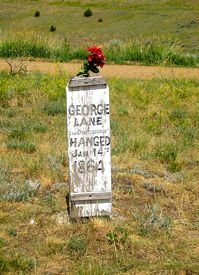 George Lane asked to see a minister before his execution, which was scheduled first. Forced to stand on a box under the noose, Lane spied a friend and yelled out, “Goodbye, old fellow, I’m gone.” He then leaped from the box without waiting for it to be removed. He and the others hanged that day were buried in Virginia City’s Boot Hill Cemetery without benefit of markers. Some 43 years after the burials, many began to wonder who was in each grave. In 1907, a former vigilante came forward, saying that he new the order of the graves and which one was Club Foot George’s. 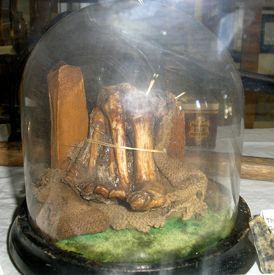 Clubfoot George Lane’s foot in Virginia City, Montana by Kathy Weiser-Alexander. To prove his point, the city soon dug up the grave that was allegedly Clubfoot George Lane’s and low and behold, the former vigilante was correct, as the grave held the deformed foot of George Lane. The deformed foot bones were then placed in a cabinet in the courthouse. Today, however, they are on display in a glass jar at the Thompson Hickman Museum in Virginia City, Montana.